More than a delicious addition to your afternoon cup of tea, honey offers health benefits as an anti-bacterial and anti-mocrobial agent. It's also sometimes touted as a natural remedy for heartburn, but there's no scientific evidence to support that use. In fact, honey may worsen your acid reflux. That burning pain you get after eating is heartburn. It may also be accompanied by belching, bloating and an acidic taste in your mouth. It occurs when acids from the stomach flow back up into the esophagus, which is the tube that transports food from your mouth to your stomach. Sometimes the esophagus can become irritated, causing further discomfort. One theory holds that honey can soothe a sore esophagus and reduce discomfort from heartburn, just as taking honey can help soothe an irritated, sore throat. Certain environmental factors, conditions and foods are more likely to trigger heartburn. Overweight people are prone to heartburn, and eating sugar can trigger heartburn for some people. In addition, eating too much sugar leads to obesity, which can then bring on heartburn. Honey is pure sugar and, as a result, can both trigger heartburn and lead to weight gain when it is eaten in excess. So, contrary to the idea that it soothes heartburn irritation, it can actually cause or worsen heartburn. 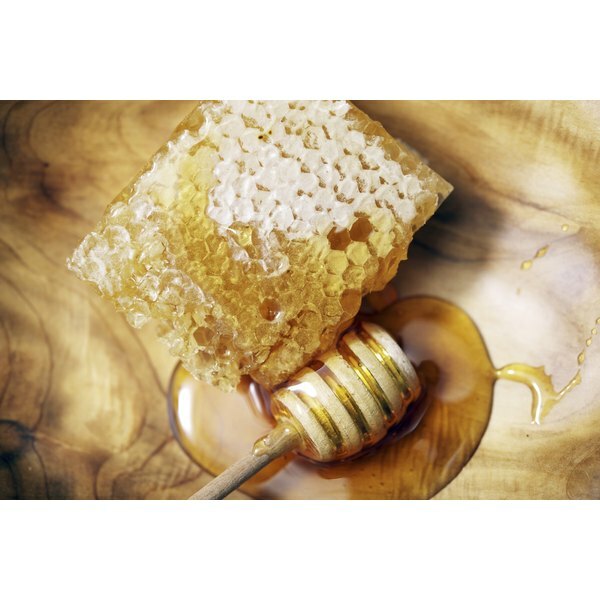 Honey contains over 17 grams of sugars and 64 calories per tablespoon. Sugar actually contains fewer grams of sugar and calories than honey, with 13 grams and 49 calories per tablespoon. The American Heart Association recommends limiting your intake of added sugars, including honey, to 100 calories per day for women and 150 calories per day for men. One tablespoon of honey provides more than half the recommendation for women and more than 40 percent of the recommendation for men. If you take honey in the hopes of soothing your heartburn and you eat other sugary foods throughout the day, you'll easily exceed the recommended limit. Keep careful track of foods that trigger heartburn and avoid them. If sugar or honey triggers heartburn for you, be sure to avoid foods that contain them. Lowering your sugar intake will also help you lose excess weight, which could help reduce your heartburn symptoms. Get regular exercise to further reduce your weight. Other strategies for dealing with heartburn include eating smaller meals, wearing loose-fitting clothing, avoiding lying down after eating and not eating within two to three hours of bedtime.